By JUST SUSIE from HARRISBURG, PA.
TranSport Aluminum Transport Chair - 19"
Lightweight. Safe. Compact. Easy To Store. Easy to Maneuver. Comfortable. Well Constructed. I bought this chair for my mom's daily caregiver would have a lightweight chair for getting mom out of the house on occasion. It was purchased to leave in the car and use for errands and little day trips, I like the chair so much I'm thinking of getting a second one to use inside the house. It's much lighter and easier for my mom to move around the house with it. The only downside to independent use is the placement of the brakes. More designed for the caregiver to use from the back. I love the chair. Comfortable. Lightweight. Easy To Store. Safe. Easy to Maneuver. Supports Weight. Love the color red . Short Trips. Long Trips. Short Distances. Outdoors. Safe. Comfortable. Easy to Maneuver. Easy To Store. Compact. Well Constructed. Sports. Long Trips. Short Trips. Daily Use. Travel. 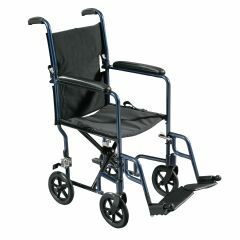 This is an ideal product for those who are temporarily not able to be self-sufficient in their mobility. Comfortable. Lightweight. Easy To Store. Well Constructed. Compact. Safe. Easy to Maneuver. Okay for short trips, foot rest are not adjustable. I am 6 feet tall . Would i be able to to handle or drive my aunt without arching and having back pain.